ThunderEssence is a veterinarian-recommended blend of natural essential oils to help calm and relax dogs during times of stress. Available in spray or drops, this combination of Lavender oil, Chamomile, and Egyptian Geranium oil can help soothe dogs with anxiety caused by separation from the family, noise from fireworks or thunder, car and air travel, and other stressors. It is also useful for veterinary visits, kennel stays, and getting acclimated to a new home or baby. Spray ThunderEssence in the air, on your pet's bedding, or directly on your pet's coat. 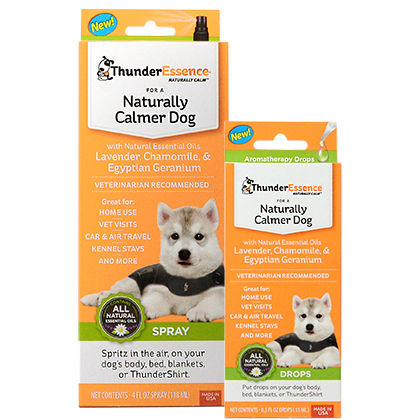 The drops or spray can also be used in combination with the Thundershirt for added calming effect. The pleasant, relaxing fragrance is also great for neutralizing odors such as the "wet dog smell". ThunderEssence is 100% safe for dogs, pH balanced, paraben-free, dye-free, and cruelty-free. It's even an effective calming aid for human use. Keep a bottle in your car's glove compartment to keep pets calm and relaxed for safer travels. NOTE: Also for use with the Thundershirt, sold separately. ThunderEssence is a blend of relaxing essential oils developed to help ease your dog's stress quickly and safely without the use of training or medication. 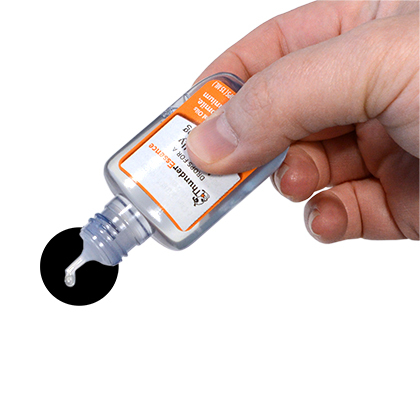 Available as either spray or drops, it can be applied directly to your pet's body or bedding, and can also be used in combination with the Thundershirt. 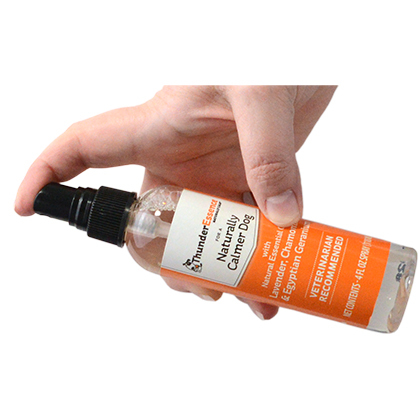 It is paraben-free, dye-free, cruelty-free and 100% safe for dogs. Use any time your dog experiences anxiety from fireworks, thunder, separation from family, travel, or other similarly stressful situations. KEEP AWAY FROM CHILDREN. Not for internal consumption. If ingested, drink milk or water. Avoid contact with the eyes. If ThunderEssence comes in contact with your eyes or your pet's eyes, flush the eyes with water. Consult a doctor or veterinarian if problems arise. For ThunderEssence Spray, spritz 2-3 pumps in the air, on your dog's body, bed, blankets or Thundershirt. For ThunderEssence Drops, put 2-5 drops daily or twice daily as needed on your dog's body, bed, blankets or Thundershirt. Avoid contact with the eyes. If ThunderEssence comes in contact with your eyes or your pet's eyes, flush the eyes with water. ThunderEssence has a pleasant aroma and can be helpful for neutralizing odors, too. Purified water, Glycerin, Lavender Oil, Polysorbate-20, Egyptian Geranium Oil, Sodium Lauryl Glucose Carboxylate, Castor Oil, Sodium Benzoate, Potassium Sorbate, Chamomile Extract. Dipropylene glycol, Egyptian Geranium Oil, Lavender Oil, Castor Oil, and Chamomile extract.